The school received an inadequate Ofsted rating in October 2017 and under the Government’s Academies Act 2010 a school whose Ofsted report is inadequate must become an academy. This is despite that report praising management of the school and noting that recent changes have not had a chance to take full effect. Even the latest Ofsted monitoring inspection of the school in May found that the school’s improvement plans are fit for purpose. However, even with these positive steps, South Shields School has been unable to find a sponsor. The local authority has reported that “the Regional Schools Commissioner (RSC) has not been able to find an academy trust to sponsor the school”. Eight RSCs were introduced by Government in 2014 to oversee and make decisions about academies in their areas. Essentially, they push for the academisation of our schools. Since 2014, RSC powers have expanded and their budget has increased more than six-fold, from £4.7million in their first full year of operation to an estimated £31.2million in the current year. The RSCs essentially have control over decisions which should be down to local authorities. There is also no evidence that academy status can itself raise attainment or improve schools. That is why Labour opposed the Government’s plans to force all schools to become academies, and successfully forced a U-turn on this policy. South Shields School, however, is not the only school to be in this terrible situation. Due to years of Tory tinkering and mismanagement, our schools are grappling with an increasingly fragmented and profit driven education system against a backdrop of £2.7billion worth of real terms cuts since 2015. Confusingly, although the legislation states schools with an inadequate Ofsted must become an academy, there is nothing in the legislation that says that a school must be made into an academy as soon as it’s issued with an academy order. There are, in fact, several alternative options available such as a preferred sponsor providing interim support, support provided by the local authority, or another sponsor, or a teaching school alliance. In answer to Parliamentary questions earlier this year, it was revealed that dozens of schools are in the same situation as South Shields School unable to find academy sponsors. 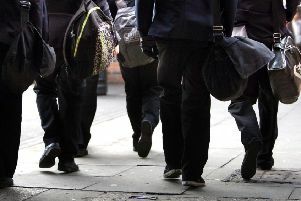 The Government’s own response revealed that 23 schools remain without an academy sponsor for more than one year after their academy order, three schools for two years or more, and nine schools for three years or more. The situation at South Shields School raises more questions than answers, but I want to assure my constituents that I will continue to liaise with the local authority, will be seeking a meeting with the Head and will be raising the matter with the Secretary of State for Education. I will do all I can to stop yet another school falling prey to this Government’s misdirected approach to our children’s education.